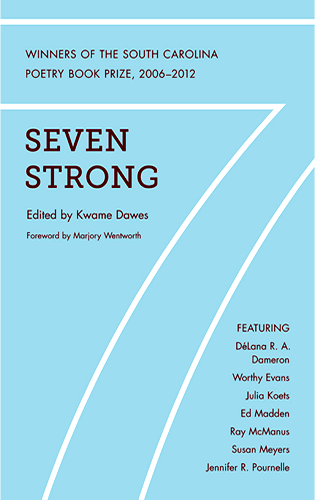 Seven Strong features selections from the winning poets to date—Susan Meyers (2006), Ray McManus (2007), Ed Madden (2008), DeLana R. A. Dameron (2009), Worthy Evans (2010), Jennifer R. Pournelle (2011), and Julia Koets (2012)—with an introduction by editor Kwame Dawes and a foreword by South Carolina poet laureate Marjory Wentworth. Representing some of the best and brightest among South Carolina’s large population of poets, these writers offer compelling vantage points on themes of identity, memory, history (both social and personal), race, gender, and community. What emerges most clearly from this collection is a sense of the creative arts as grounded in connections to place. Be those locations real or imagined, local or far-flung, in the verses collected here, place—like the poets themselves—is always provocatively authentic. Seven Strong is then a road trip for us of the most enjoyable sort, with seven distinctive guides and a landscape that stretches from quirky to cantankerous, mournful to marvelous, but we never lose sight of South Carolina in the rearview mirror.